How to draw a bee step by step. 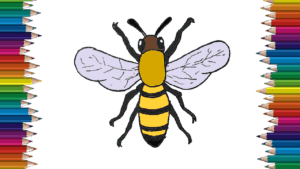 Bee drawing and coloring for kids with this how-to video and step-by-step drawing instructions. Easy animals to draw for beginners and everyone. First draw a rounded rectangle for the front (chest) of the body. Next draw the head, eyes and antenna. The head is a round square. The eyes are long oval along the sides of the head. The two antennas are thin rings drawn at the corners facing off the top of the head. Now draw the bottom part of the body. It has oval shape and is twice as long as the chest. Draw segments on the body. These are lines on the body. Add wings on both sides of the top part of the body. They have triangles. The longest face is on the top. Start adding feet. The front left leg is the front wing. It has four very thin sections and faces outwards at the same angle as the left antenna. Add a front leg on the right side of the head. It also has four thin segments long and located at the same angle as the right antenna. Draw another left leg just below the left wing. It has four segments and is the same size as the front leg. This leg points down and at an outside corner. Draw another middle leg on the right side of the body. It also has four long thin sections and points down and outwards. The last leg on the left is just behind the middle leg. It is the same size as the middle leg and also points down and out. Add the last leg to the right of the body. It is the same size as the last leg on the left. It also points down and points out. You add the color to the bee with two main colors: gold and black.